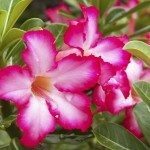 When I plant desert rose seeds in small seed growing plastic containers, how much to water it - daily basis or not? Can I keep in direct sunlight? You want the soils a bit moist but not real wet for germination. If you do put them in direct sunlight, keep a close eye on the soils moisture as letting them dry out just once after germination can cause problems. I also recommend purchasing a soils moisture meter/tester as they are great for monitoring soils moisture in a the areas of the soils planted.